Whenever we are , it might happen that we notice some bleeding. More specifically, blood coming from our gums. Why does that happen and how do we fix it? It is linked to a widely talked about issue called gum disease. In today’s article we want to cover some topics as well as provide helpful information towards gum disease with the help of Los Algodones Dentists. How do we stop this bleeding and what do we do to prevent it are the questions we want to address and leave answered the most. What is causing this bleeding? Gum disease. This is where the gums are irritated by a buildup plaque. If we do not take care of the plaque that can be hidden around our gumline then bleeding is inevitable. Medication. Some medication can affect our blood, making it clot less, resulting in an easier time bleeding. Hard-bristled toothbrush or brushing. Los Algodones dentists suggest the use of a soft-bristled toothbrush because the goal is to brush off food, bacteria and plaque without harming our tooth enamel. Also it is important to note that gentle brushing is enough to take care of the sticky plaque. Harsh flossing. There are also the cases where we use dental floss way too hard. We recommend the use of a waxed floss as it will have an easier time sliding and wrapping around our teeth. 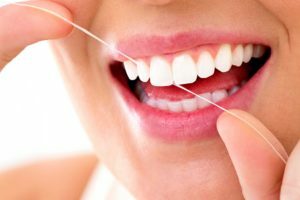 Pay attention not to apply much force when using floss as the snapping of the thread can harm your mouth. The most common reason behind bleeding gum is precisely gum disease, which we should be wary of. In very simple words, gum disease makes your gums irritate, making them puffy and red, while also targeting the supporting bone which in worst case scenarios lead to tooth loss. Gum disease can be divided into four stages: gingivitis, early periodontitis, moderate periodontitis and advanced periodontitis. To determine the stage in which the patient is at, the dentist uses a special tool to see how inflamed and puffy the gums are. Tooth stains. If you have been slacking on your dental habits, it is common for teeth to be stained with all sort of things: food, drinks, blood, plaque, and more. Receding gums. Constant damage to the gums prone them to pull back. This is also known to happen with gum disease. This can lead to exposed roots which have far less protection and are more prone to tooth decay. People with diabetes have to be wary. As you know, there is inflammation involved on both diabetes and gum disease. So it is known that these both do not pair well and only make each other worse. Pay extra attention to your oral routines. Brush twice a day for 2 minutes each session. Floss once a day, and rinse your mouth thoroughly after eating! Make use of products available. Soft-bristled toothbrushes, as well as toothpaste and mouthwash targeted towards gum disease. They all help. Contact your physician if it is medicine related. Sometimes bleeding gums can be avoided by changing doses or the medicine altogether. Check with your dentist semiannually. They are professionals at what they do, so checking the state of your mouth and how it is developing is one of them! They also boast years of experience dealing with those issues, so they know the most efficient ways. No Replies to "Bleeding Gums: Why And What To Do?"